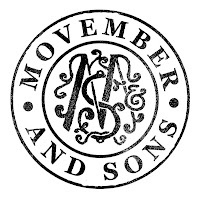 There are some of you out there who have been lamenting the very existence of Movember. All the bad facial hair, from teenaged-equivalent growth to full-on pr0n staches. I don't at all agree with you: I love me some MOs. In fact, hubby has been sporting his most excellent handlebar MO since last November, refusing to shave it for Movember this year due to his client-facing job. So, I took it upon myself to do the fundraising this year. My original goal was $500, but with so many incredible generous donations, including two of $200 apiece, I hit that goal before mid-month. Since then, I reset my goal to $1,000. I thought it was easily in reach but it looks like I will be $158 short if I can't get some donations in today. If you haven't donated yet, please consider supporting me by donating on my MoSista page. A sincere thanks and shoutout to all of you who have given to me, to my team and to Movember. I am incredibly thankful for your support. And a special shoutout to my team: Marc, Blaise, Maxime, Larry, Philippe, Chris, Rae-Ann and Arianne.